Learn the best glute exercises for men and women. The glutes are such an important muscle for improving performance and decreasing the risk of lower body injuries. Strong glutes are especially important for runners and any athlete that jumps, and strong glutes play a significant role in protecting the knees from injury. The body is a chain and when the hip is stable the knee is more stable. Leg Machines can strengthen all of the leg muscles, but most leg machines neglect balance, coordination, and core stability. When you look at sports and physical activities (like hiking and walking), most are done standing up, so the best way to strengthen the glutes is during standing exercises like squats and lunges and 1 leg balance exercises. Balance exercises are great for strengthening the glutes and stabilizing the knee joint, and you can use a cable machine to work on both strength and balance. The Gluteus Maximus works to stabilize the pelvis and hip and in turn helps to stabilize the knee joint. The gluteus maximus also works to pull your hip backwards (hip extension). Below is a great hip exercise for the glute maximus using a cable machine, and as an added benefit the hip stabilizers on the standing leg are also strengthened at the same time. Starting Position: Begin by securing an ankle cuff around your leg and select an appropriate weight. Place your hands on your hips and balance on one leg. Form: While keeping your knee straight, move your hip backwards. Hold for a brief second and then return to the starting position. Focus on keeping good posture throughout. Engage your abs and core muscles and stand up tall. Only move as far back as your hip allows without excessively arching your lower back or tilting forwards from your pelvis. 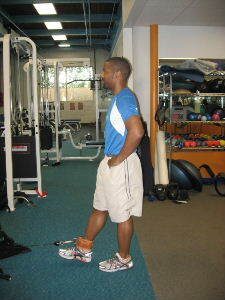 Cable exercises are some of the best glute exercises for men and women to improve balance and stabilize the knees. This is a great exercise for runners and people suffering from certain types of knee pain. 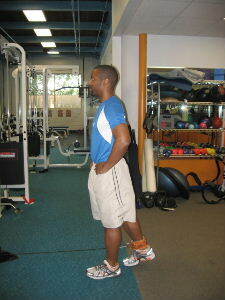 Another great hip exercise for men and women is cable hip abductions.